Inspiration and resources for your Hamlet essay. 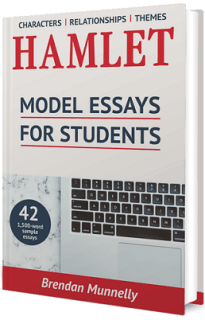 Inside Hamlet: Model Essays for Students you will find three 1,500-word essays on each of the play’s main characters, relationships, and themes—a total of 42 easy-to-read, quick-to-rewrite and written-to-inspire sample essays. BELOW Scroll down for inspiration and resources for your Hamlet essay. 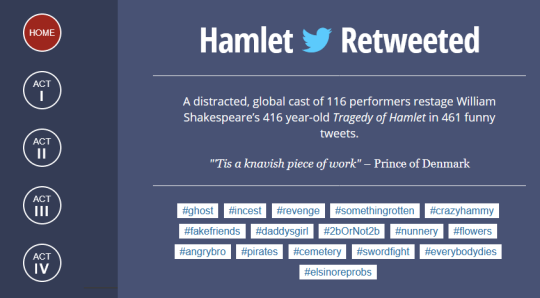 William Shakespeare’s 400+ year-old Tragedy of Hamlet retold in 461 funny tweets by 116 students from around the world. An excellent starting point for anyone new to the play. “’Tis a knavish piece of work” – Prince of Denmark.